Chili Verde is in my top five favorite things to eat. After trying a few different recipes I have come up with one that is easy and super tasty. Add pork to crock pot and cover with all ingredients except cornstarch and sour cream. When ready to serve, pork will shred very easily. Remove pork from the crock pot and shred into a large skillet, spoon out veggies and add to skillet. In a separate sauce pan pour liquid from crock pot. Dissolve 2 T. of cornstarch in 3-4 T. of water to make a thickening paste. Add to sauce and whisk continuously for 5 minutes or until thickens. Add in sour cream and stir well. 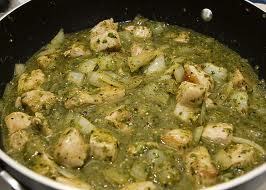 Spoon thickened verde sauce into pork in the skillet. Cover and simmer on low for 10 minutes. Serve over rice or in warmed corn tortillas with cheese and fresh tomatoes.